With approval ratings showing that Donald Trump is the most unpopular new White House occupant of all time, and his first two weeks in office having been calamitously divisive, it’s now a matter of when and not if the House of Representatives will be forced to begin impeachment. The Republican House majority will be overly hesitant, because it doesn’t want impeachment proceedings to distract from its own current legislative agenda. But at some point they’ll have to do it to save face. And Congressman Joaquin Castro says it’s coming. 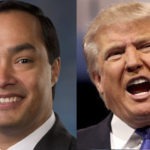 Joaquin Castro, a Democrat who represents Texas in the U.S. House of Representatives, is asserting that Donald Trump has already committed a crime against the Constitution by ordering border agents to continue enforcing his executive order banning Muslims, even after a federal judge issued a stay against the order. In a sign that the Trump administration is perhaps aware it made a mistake by crossing the line, it’s now denying that it ever happened. But there’s ample evidence that Trump was indeed egging on agents to defy the court, which is clear cut crime against the Constitution — and Castro says it’s enough to impeach. There are two key factors at play here. One is that impeachment does not equal removal. Impeachment hearings can be dragged out for a year or more in the House, and can be used to prevent a president from being able to accomplish much of his own agenda in the mean time. Whether or not the Senate subsequently moves forward with an impeachment trial, and whether or not that president is removed from office, may be secondary. So impeachment is not necessarily about swapping Trump for VP Mike Pence in the oval office; it’s more about crippling Trump. The second factor is that while the Republicans in the House of Representatives will be hesitant to impeach a lunatic president from their own party, both because it’ll distract from their own agenda and because it’ll be an embarrassing stain going forward, there is a point of no return at which they’ll do it. If they conclude that not impeaching the toxically unpopular Trump will do more harm to their own reelection chances in 2018, they’ll go ahead and impeach him to save themselves. For reference, Richard Nixon’s approval rating had to drop into the twenties before his allies in Congress finally moved to impeach him, prompting his resignation. Donald Trump’s approval rating is currently in the thirties, so there’s some work to be done.